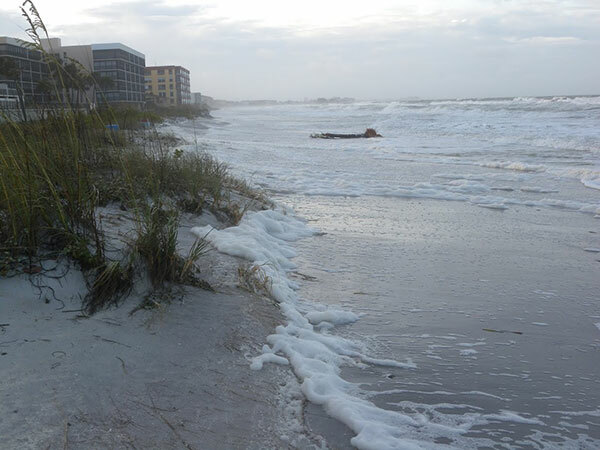 Wave runup and storm surge reach the dune toe on St. Pete Beach, Florida, during Tropical Storm Debby. This research examines the physical processes at work prior to, during, and following coastal storm events. Coastal change processes take place over a wide range of temporal scales - from hours and days during a storm to years and decades as a beach recovers. Understanding the processes involved in coastal landform evolution will improve the accuracy of the assessments of storm-induced coastal change hazards. Some current storm-induced process studies include: wave runup processes during storms, spatial and temporal variability of coastal change, and integration of storm response with longer-term changes. Wave runup during storms is a primary driver of coastal evolution, including shoreline and dune erosion and barrier island overwash. 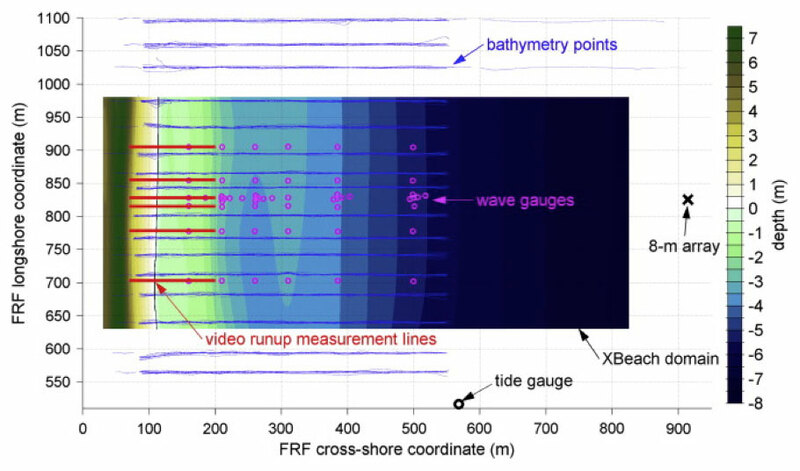 Runup and its components, setup and swash, can be predicted from a parameterized model developed by comparing runup observations to offshore wave height, wave period, and local beach slope. Because observations during extreme storms are often unavailable, a numerical model (XBeach) can be used to simulate the storm-driven runup to compare to the parameterized model. After testing the accuracy of the numerical model, simulations are used to extend the parameterizations to include storm conditions that have not been previously observed. Results from this study indicate that the parameterized predictions of setup may need modification for extreme conditions, and numerical simulations can be used to extend the validity of the parameterized predictions of infragravity swash. Nearshore bathymetry (NGVD), wave and water level measurement locations, and XBeach model domain in the vicinity of the U.S. Army Corps of Engineers Field Research Facility (FRF). Observations and XBeach simulations of setup (a), infragravity swash (b), and incident swash (c) compared to values parameterized using the Stockdon and others (2006) model. Comparisons to video-based observations are shown in green. Comparisons to numerical simulations using XBeach are shown in red and blue. Numerically simulated hurricane conditions (black) are used to determine if the parameterization can be extended to extreme storm events or modifications are needed. Stockdon, H.F., Thompson, D.M., Plant, N.G. and Long, J.W., 2014, Evaluation of wave runup predictions from numerical and parametric models: Coastal Engineering, v.92, p. 1-11. http://dx.doi.org/10.1016/j.coastaleng.2014.06.004. Extreme storms drive change in coastal areas, including destruction of dune systems that protect coastal populations. Data from four extreme storms impacting four geomorphically diverse barrier islands were used to quantify dune elevation change. This change is compared to storm characteristics to identify variability in dune response, improve understanding of morphological interactions, and provide estimates of scaling parameters applicable for future prediction. Locations where total water levels did not exceed the dune crest experienced elevation change of less than 10%. Regions where wave-induced water levels exceeded the dune crest exhibited a positive linear relationship between the height of water over the dune and the dune elevation change. In contrast, a negative relationship was observed when surge exceeded the dune crest. Results indicate that maximum dune elevation, and therefore future vulnerability, may be more impacted from lower total water levels where waves drive sediment over the dune rather than surge-dominated flooding events. Normalized dune elevation change at the position of the pre-storm maximum dune elevation (Dhigh) as a function of extreme water level (Rhigh)/Dhigh for the (a) collision, (b) overwash, and (c) inundation regimes. Note that the x axis is not unique between the overwash and inundation regimes because the definition is dependent on mean water level (Rlow) rather than Rhigh. Circles correspond to extreme storm events: Nor'Ida (hollow circles), Hurricane Ivan at Santa Rosa Island, Florida (black), Hurricane Ivan at Dauphin Island, Alabama (red), Hurricane Katrina at Dauphin Island, Alabama, (blue), and Hurricane Ike at Bolivar Peninsula, Texas (grey). Long, J.W., deBakker, A.T.M., and Plant, N.G., 2014, Scaling coastal dune elevation changes across storm-impact regimes: Geophysical Research Letters, v. 41, no. 8, p. 2899-2906. Prediction of barrier-island response to hurricane impacts is important for assessing the vulnerability of communities, infrastructure, habitat, and recreational assets to the impacts of storm surge, waves, and erosion. A conceptual model intended to make qualitative predictions of the type of beach response to storms (e.g., beach erosion, dune erosion, dune overwash, inundation) can be reformulated in a Bayesian network to make quantitative predictions of the morphologic response. In an application of this approach at Santa Rosa Island, FL, predicted dune-crest elevation changes in response to Hurricane Ivan explained about 20% to 30% of the observed variance. An extended Bayesian network which included the original variables of dune elevations, storm surge, and swash and added beach and dune widths as input variables showed improved skill compared to the original model, explaining 70% of dune elevation change variance and about 60% of dune and shoreline position change variance. (a) Definition sketch of the beach and dune environment. Dashed line shows the post-event beach and dune surface, with elevations referenced to the still water level (swl). 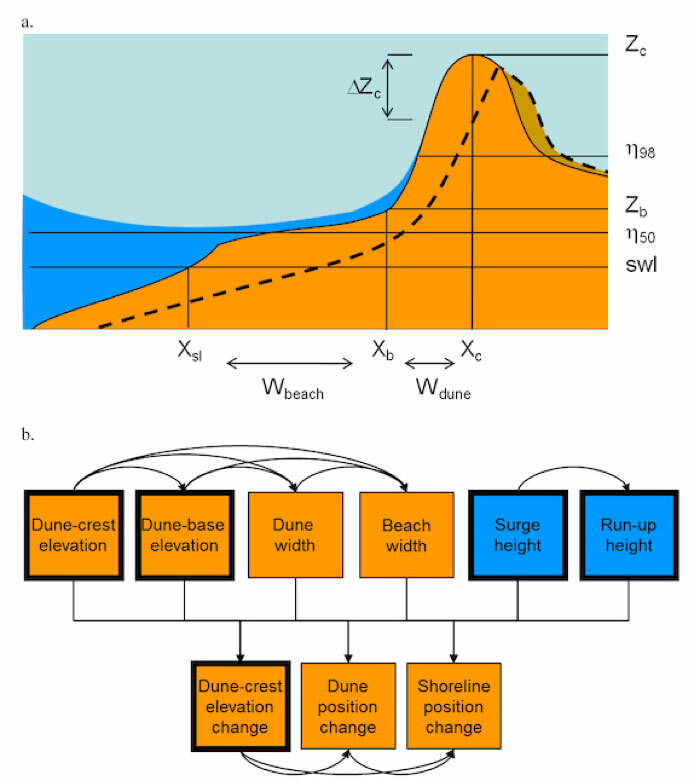 Dune and beach variables include dune crest elevation (zc) and cross-shore position (xc), dune base elevation (zb) and cross-shore position (xb), shoreline position (xsl), beach width (Wbeach) and dune width (Wdune). Hydrodynamic variables include mean (η50), and extreme (η98) water levels, (b) Schematic diagram of the Bayes network representing a conceptual model of this system and its evolution. Variables in boxes with bold outline represent the original model and the non-bold outline boxes are variables that extend this model. These related research projects focus on understanding the long- (decadal to centennial) and short-term (seasonal to annual) behavior of barrier island systems.